Located in the heart of Chalmette for over 20 years, we aim to please our customers by serving the best burger in "da parish." Our crowd favorite is our signature Brewster burger, a 10 ounce charbroiled burger, topped with cheese and served with a delicious side. For those with a smaller appetite, we offer the baby Brewster burger, a 4 ounce version of your dream burger. We also pride ourselves in the quality and taste of our steaks. Customers love our 8 and 14 ounce Rib Eyes! For those looking for a lighter meal, we offer many different salad options. Our most popular salad is the Chicken Caesar salad, but we invite you to try our tuna and shrimp salads too! 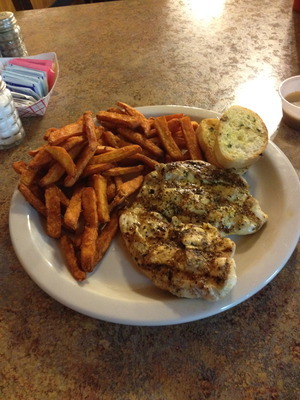 All of our meals are cooked to order with your choice of one delicious side item. We offer soft drinks, water, sweet tea, and a full bar of beer and alcohol to quench your thirst. With 6 big screen tvs throughout the building, you can be sure to find some cheering sports fans throughout the year. Need a spot to eat and get some work done? We have you covered! Free wi-fi is available throughout the restaurant and lounge. As of January 2014, Brewster's is completely non-smoking throughout the restaurant and lounge, but we do offer a smoking section outside.